Easily operates with performance for sanding flat objects. Heavy sheet metal cabinet stand. Balanced cast aluminum sanding drums. Two different grits and level sanding drums are designed for fast and fine finish at one pass. First drum is cast aluminum; second drum is coated with rubber for fine sand paper. 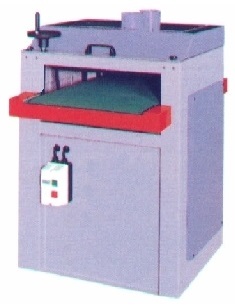 Automatic feeding operates by non-slipping rubber grips conveyor. Raise or lower the table easily by large hand wheel. Three spring-loaded pressure rolls keep the object flat on conveyor without sliding. Full power industrial motor for durability usage. Magnetic switch with overload protection.